It's bright, isn't it? I designed the background in EQ7 so I could get the proportions and colors right ahead of time. Note - I'm so loving the Electric Quilt software. It's makes auditioning different designs and fabrics so easy. This design uses 32 Hunter's Star blocks that finish at 2.5". There aren't a lot of pieces to each block, but the pieces are small. 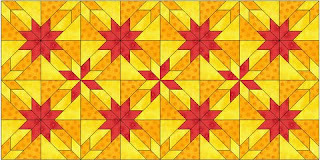 With all the points to line up, I would have had a hard time making the blocks using anything other than paper piecing. And that's when I discovered another fabulous feature to EQ7. You can print your foundations to any size you need. I added a Tiger Lily to the lower right hand corner. I found a picture of one online and used it as my template - changing the colors to match what I needed. I added a pocket to the inside of the back and front covers to hold papers and such. I used clear plastic vinyl like you get at Walmart or JoAnn's. My local quilt store, Quilts Like Crazy, had done something similar with binder covers and I got the idea from them. I just added a binding to the top of each piece of plastic and sewed it like normal. 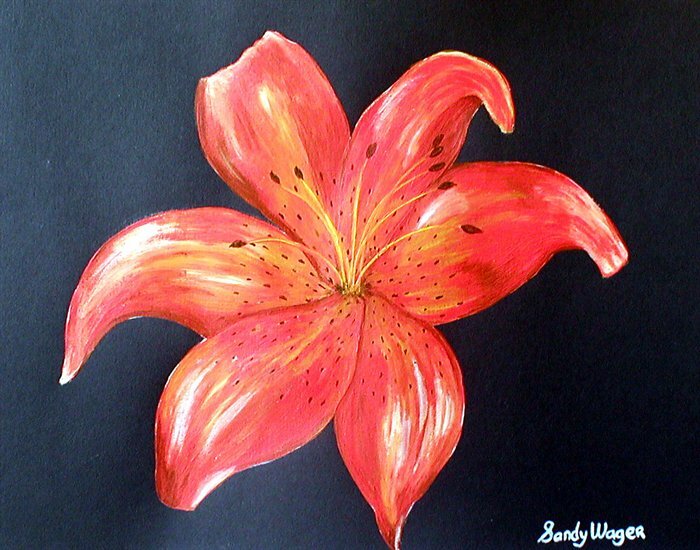 I also added another stylized tiger lily to the inside. I enjoyed making this cover and I hope Charlyn gets a lot of use out of it. It had been a while since I had done any paper piecing and I made a number of mistakes in the beginning. But once I got the hang of it again, it went together fairly quickly. And you can't beat paper piecing for its accuracy! I am playing around with EQ7 also and enjoying it. Would love if you could share the file. Your sketchbook cover and tiger lily applique is just wonderful - congratulations. I'll bet it was hard to part with.